There can’t be much mystery surrounding the invention of the double burger. After one bite of the very first burger, that lucky individual is likely to have asked how it could be made better. The answer, clearly, would have been—then as it is today—to add a second patty. It is a natural expectation, therefore, to expect the same out of our burger accessories. 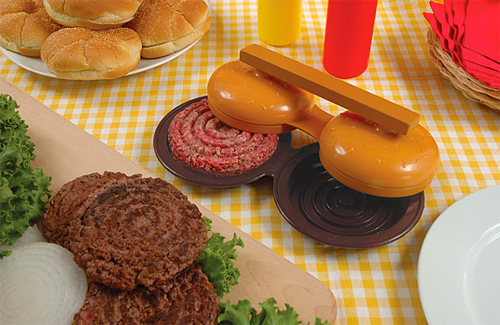 The Double Plastic Hamburger Press features the ability to press two patties at a time, giving burger-makers the logical kitchen gadget they need to get the job done right the first time. While there may not be much speculation as to how long it took to discover that two patties were indeed better then one, there does remain some question as to if they had fries with that. Hamburgers do well with a little compression. Otherwise it’s just ground beef. Loosely jumbled together ground beef. That’s no way to eat a burger. One way to ensure those burgers stay together is to use a burger press, but usually that means eating a burger where thickness is dictated by the gadget. 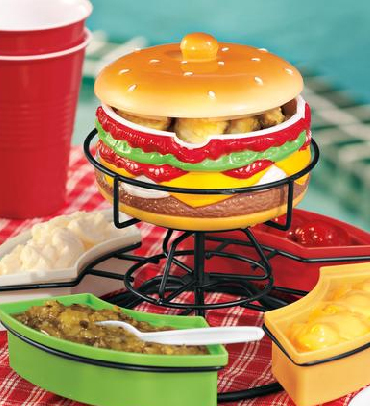 Not so with the Adjustable Burger Press. 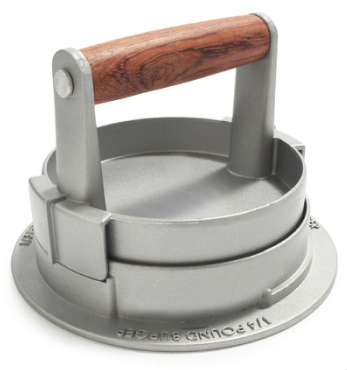 Constructed of non-stick cast aluminum with a rosewood handle, the burger press is capable of making a patty for everyone. Adjustable for either quarter-pound or half-pound patties (along with my personal favorite, “etc.”), the hamburger you want is only a press away. Every meal needs embellishing. Some play it safe and stick with the salt and pepper, some take it up a notch and add hot sauce, and others, well, some people need a little bit of everything. 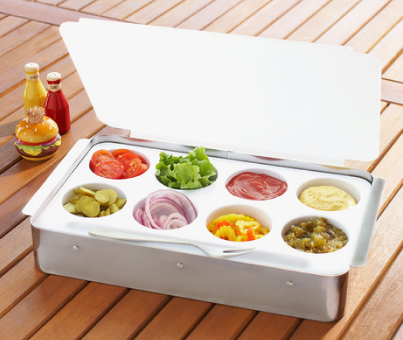 Designed with burgers in mind, but really appropriate for every meal, the Slider Central Condiment Caddy provides space for up to eight condiments. The 15.5-inch by 9.5-inch serving vessel is only 2.5-inches tall and comes complete with a semi-transparent lid, making it perfect for outdoor feasts—or for just keeping the go-to set of condiments always at the ready inside the fridge. You don’t always know what you’re going to get when you bite into a hamburger. Other than the fact that they can be rare, medium or well-done, burgers can be made out of many different basic ingredients, from the traditional beef, to healthier alternatives like turkey or even grains. 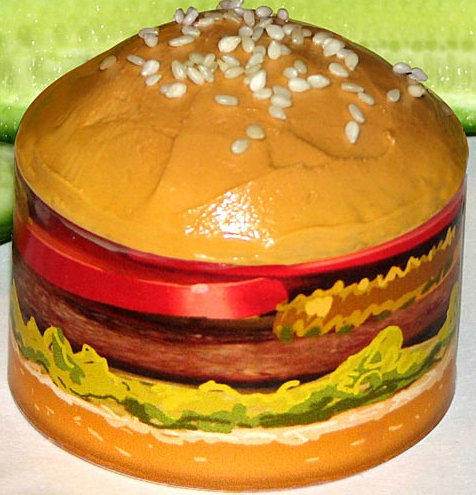 However you like your burger, chances are it’s not as sweet as this one. Not all hamburger dreams are delicious. Some are tainted, not with suspect meat, but with spinning and whirling parts that make more noise than they should. (Especially nightmarish considering that a hamburger shouldn’t make any noise.) However, once in a while, along comes a burger designed to chime its way into our hearts (without the cholesterol, that is). 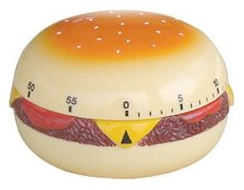 Case in point: The 60-Minute Hamburger Short Ring Alarm Kitchen Timer. Measuring around 3-inches across, the charming kitchen gadget keeps track of time in one minute increments. And whether or not your hamburger dreams are pleasant and tasty or filled with mechanical burgers bent on revenge, with about a four second bell duration, this burger timer is a lot more pleasant than an alarm clock.